If you're planning a trip to London, don't skip the neighborhood Notting Hill. No, it's not just a movie. It's an actual place. In this area, you'll find a lot of restaurants, bars, street art, amazing buildings and vintage stores. Believe me, you don't want to miss this part of London at all. 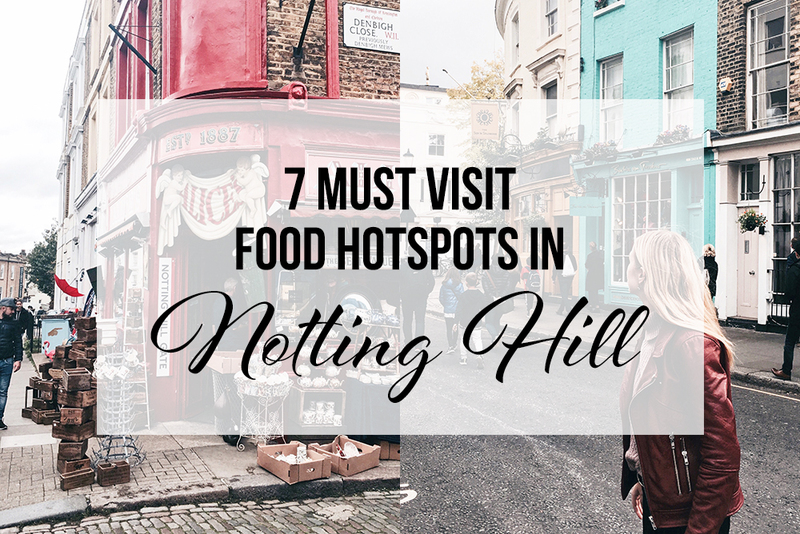 That's why I made a list with some must visit food hotspots in Notting Hill. Lunch, breakfast, dinner, snacks, drinks. It's all in this list! Book your stay through my Booking.com link and get a 25 euro discount! Luckily Granger & Co has multiple locations in London, and one of them is in Notting Hill. This place is perfect for breakfast but also for lunch, dinner and/or drinks. The interior looks amazing and the food is very tasty! Not only is the entrance of this hip cafe beautiful, the inside is beautiful as well! They serve fresh, healthy and delicious food. It's one of the most popular hotspots in Notting Hill but it's worth the wait for sure! Looking for a vegan hotspot in Notting Hill? Redemption is the place! The menu is amazing, so deciding what to eat here might be difficult. A great place for lunch, dinner or alcohol free. And if you don't end up visiting Notting Hill, visit their location in Shoreditch. In a hurry or just want to eat a meal on the go? Go to The Grain Shop located at Portobello Road and get yourself a vegetarian/vegan take-away meal! Even most of the desserts here are vegan. If you're craving some good & special Asian food, Uli is where you should go to! They believe that Asian food should be clean, fresh and healthy. Doesn't that sound perfect? They're located at Ladbroke Road. At Jusu Brother they're all about pan-asain flavors, organic bites, juices and all-day food. The way they decorated the place is beautiful and really picture worthy as well. So if you're walking around Notting Hill, make sure you visit Just Brother as well! For a tasty authentic Thai all you can eat buffet, Brown Rice is the place to be! Located at Portobello Road in Notting Hill, and open for breakfast, lunch, dinner and bites. And lucky for us, they're open every daily! These are a few of my favorites. But while walking around this neighborhood, I noticed that there are plenty of food hotspots in Notting Hill. A good reason to come back another time, right? Are you planning a trip to Notting Hill yourself? If you book through my Booking.com link, you’ll get a €25 discount on your stay! And make sure to read this post about things to do like a local in London! Have you ever visited Notting Hill? If so, which hotspots in Notting Hill would you recommend?